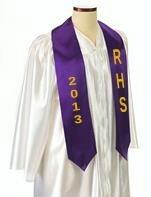 The Purple Custom Graduation Sash is made of quality bridal satin. Includes one color twill lettering on both sides. See Options for pricing for two color twill. No setup fee on repeat orders. Imprint area approximately 3" x 14".